Mr. Cao Weixing, Vice Governor of Jiangsu Province, said at the opening ceremony that this Culture Week in London was aimed at providing a channel for the visitors from Britain and around the world to understand the culture of China and Jiangsu through cultural exchanges on the occasion of the Olympic Games, so as to further enhance friendship, exchanges and cooperation. 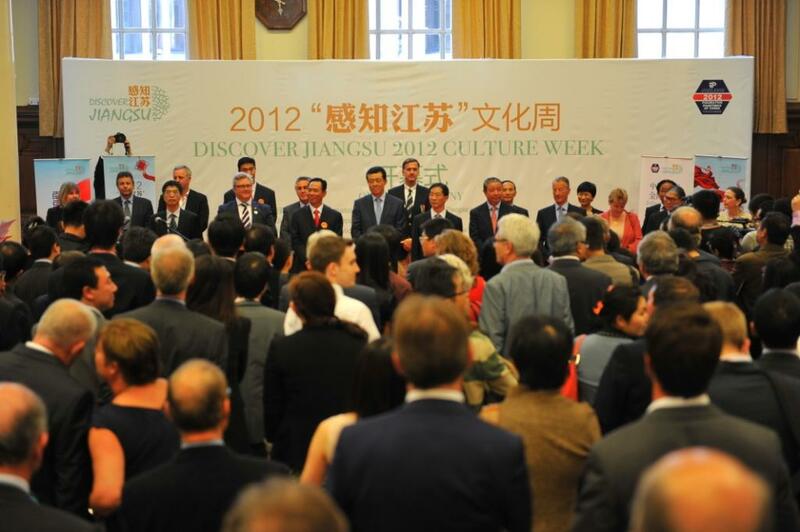 Ambassador Liu Xiaoming extended warm congratulations on the “Discover Jiangsu” Culture Week in Britain. He introduced the economic and social development and historical and cultural characteristics of Jiangsu. Ambassador Liu said that concurrent with the Thirtieth Olympiad, ‘Discover Jiangsu’ has arrived in the Central Hall, Westminster. It invites us to a cultural feast. The main courses will include: An exhibition of works by young Chinese painters, a show of Nanjing’s intangible cultural heritage, a display of Chinese treasures and cultural performance. The ‘Discover Jiangsu’ will also promote the 2014 Youth Olympic Games. It will offer visitors new and multiple perspectives of this wonderful part of China. The “Discover Jiangsu” Culture Week is composed of three theme exhibitions and a cultural performance. The “China Jinling Art Exhibition of a Hundred Painters” was held at the Central Hall, Westminster. The exhibition displayed 60 pieces of Chinese paintings and oil paintings, which are mainly on social development, urban and rural landscape, natural landscape and public life and stress realist and natural ways of expression. The “When Nanjing Meets London” Promotion Fair was also held at the Central Hall, Westminster. It illustrated the many things in common between Nanjing and London with rich contents. For example, both cities have a long history and they respectively boast the Qinhuai River and the River Thames. The exhibition also displayed the Yunjin Brocade, the paper cutting, the scriptural press and other intangible cultural heritage from Jiangsu. It promoted the 2014 Nanjing Youth Olympics at the same time. The “China Treasures Exhibition” from the Nanjing Museum was held at the Colchester Museum, Essex County. It displayed 70 pieces of Chinese jade, pottery, bronze, porcelain and other artifacts. Jiangsu Province and Essex County northeast to London became sister province and county in 1992. The two sides are carrying out extensive exchanges and cooperation in trade, economy, education, culture, tourism, sports, environmental protection and other fields. In addition, in the night of the opening ceremony, dozens of Jiangsu artists brought a “concise” cultural performance to the guests. The performance was composed of the Jiangsu folk song “Jasmine”, an excerpt from Kunqu Opera “Peony Pavilion”, an excerpt from Pingtan “The Romance of the Western Chamber”, an excerpt from the Beijing Opera “Drunken Beauty”, puppet shows and acrobatics, presenting a visual feast to the Chinese and foreign audience. According to reports, the Cultural Week was jointly organized by the Jiangsu Provincial Government, Nanjing Municipal Government and Nanjing Youth Olympic Games Organizing Committee. “Discover Jiangsu” has been successfully held in more than 40 cities of over 20 countries, including the United States, France, Germany and Japan. It has become a well-known cultural exchange brand of Jiangsu.